New York Musk Emerald Swarovski Shooting Star by Bond No 9 is a Floral Woody Musk fragrance for women and men. This is a new fragrance. 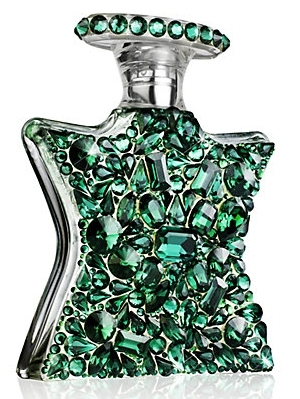 New York Musk Emerald Swarovski Shooting Star was launched in 2012. Top notes are grapefruit blossom and black currant; middle notes are osmanthus, green lily and nutmeg; base notes are musk, patchouli, vetiver and sandalwood. Looks to be the same as New York Musk, except blinged out. Yes it does and pass. Is this the longest name ever? Life is too short to sample. Buy Blind | I am generally not interested in batch hunting or weak fragrances. Nice to know BN9 made a fragrance for The Hulk, Shame he smashed it already. Another long one. Guerlain - Shalimar Ode a la Vanille Sur le Route de Madagascar 2012. Somehow I'm disappointed this wasn't a joke, after reading the title. Nice fragrance. I'll pass on the bedazzled bottle. Does anyone buy the Swarovski crystal versions? If I want to spend that much on crystals, they wouldn't be glued randomly onto a Bond No. 9 bottle.